About this objectA.W. Elson & Company (ca. 1894-1925) was a distinguished printing and Publishing House. The establishment functioned in the late 19th century to the early 20th century—distributing photos and published writings. Entrepreneur Alfred W. Elson owned and operated the establishment. The company resided at 146 Oliver Street, Boston Massachusetts. The company found a niche in producing historical images and scenes, as well as reproductions of portraits and artwork. The company were also plate printers, that produced photogravure plates. 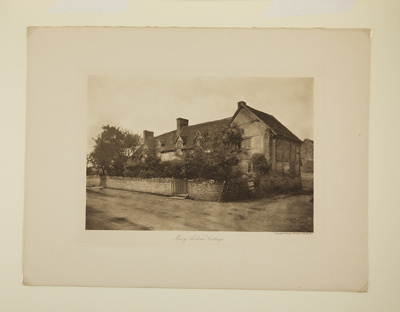 The establishment also produced large carbon photographic prints, etchings, engravings, and copper-plate paintings. The products produced at Elson & Company were seen in homes, museums, schools, colleges, and libraries. Depicted is the childhood home Mary Arden—mother of author/playwright William Shakespeare. In the 21st century the 16th century house is now called Mary Arden’s Farmhouse. The home was a typical 16th century farmhouse when Mary Ardent grew up there with her seven sisters. Today, the structure is a tourist site with farm-work demonstrations. Place NotesThe photo was taken in the village of Wilmcote, nearly three miles from Stratford-upon-Avon.